Davis Love has some hard choices to make very shortly to round out the 2016 Ryder Cup Team. The top eight players for the American side have been finalized. Dustin Johnson, Jordon Spieth, Phil Mickelson, Patrick Reed, Jimmy Walker, Brooks Koepka, Brandt Snedeker, and Zach Johnson have earned their spots on the team. Davis has four Captain picks and will choose three players soon and one more after the conclusion of the FedEx Tour Championship on September 26. The next four players in order of points earned are Bubba Watson, J.B. Holmes, Ricky Fowler, and Matt Kuchar. Bubba Watson is a no-brainer to be selected. He is currently ranked the seventh best player in the World Rankings. I would want him on my team, but I would not want him on the last hole with the title on the line or having to make the last six foot putt. J.B. Holmes is a strong head to head player and the type that would excel in these types of pressure situations. I would select him. For those that regularly read my blog, the next two players have been in my "Sure to Disappoint" category when I have picked favorites for major championships. Ricky Fowler is such a good person and would make a great teammate, but he doesn't seem to have it when it really counts. This past week, at Bethpage Black, was a good example. I think there are better tougher competitors that should be on the team. Matt Kuchar is another that should be winning much more then he has. He moves up in major competition and as soon as you think he is going to make a move, he moves backwards. His great finish in the Olympics might have energized him to greater things. I would select him, but would pair him with stronger willed players. The last spot will be selected on their performance in the final three FedEx tournaments. That player will be on a hot streak and you just want to keep riding him for all its worth during that stretch. I hope it will be one of the younger players like Kevin Kisner, Justin Thomas, Kevin Chapell or Scott Piercy. If it isn't, then I would go for Jim Fuyrk over Bill Haas because of his recent play and his tough guy competitive spirit. I love the Ryder Cup competition and the head to head match play environment. There is a winner and a loser in each match and each shot has greater meaning then in normal PGA events. It can bring out the best and worst in all players. Some just relish the grand stage and others do not. The US Team this year is strong and will have a good chance to take the Cup home for the first time in eight years. 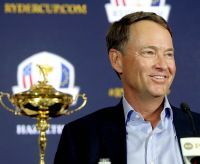 The FedEx Championships will be exciting to watch, but the Ryder Cup this year looks like it could be really special.